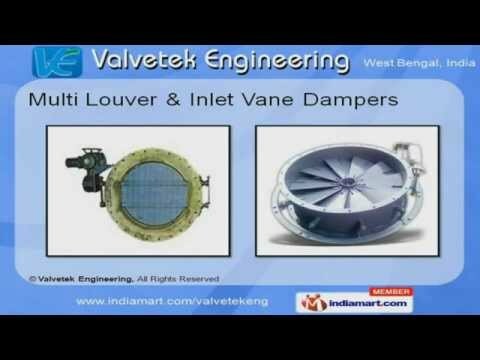 Welcome to Valvetek Engineering Manufacturer & Supplier of Industrial Dampers Products. The company was incorporated in 2009 at Kolkata. We serve to Pollution Control, Steel & other industries across Indian Subcontinent. Comprehensive range of products, large production capacity, stringent quality control measures & effective packaging facility are some of the key attributes of our organization. We are engaged in offering Butterfly, Guillotine, Multi Louver, Inlet Vane, Motorized Multilouver & Parallel Blade Dampers. Our Butterfly & Guillotine Dampers are fabricated form premium grade raw materials. We are specialized in offering Multi Louver & Inlet Vane Dampers. Sleeve Brushes, Stuffing-Boxes & Ball Bearings are some of our best selling products. Along with that we offer premium grade Motorized Multi Louver Dampers with Direct Mounted Actuators. Our Flow Control Gate, Opposed & Parallel Blade Dampers are a class apart.